hops, Ringwood yeast, & water! Come in to purchase 64oz/1.89L refillable growlers. Fill it with what's on tap and consume fresh. When you're ready for more, come back for a refill. Find out what's on tap on our website, or check out our Facebook or Twitter feeds for daily updates. 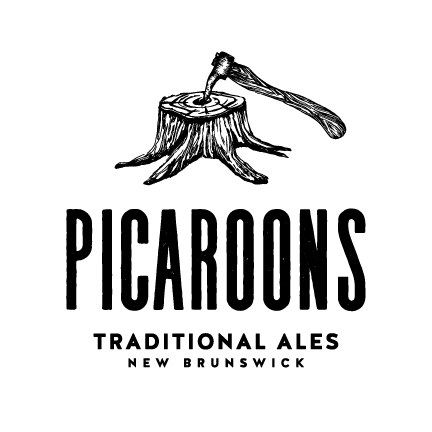 You can also buy individual bottles of Picaroons at The Five Kings, as well as a small sellection of other local NB craft beers. Imperial IPA || At the centre of this Imperial IPA is a solid foundation of Canadian 2-row barley with a dash of Canadian Toasted Wheat. Around this foundation we will pivot the hops from batch to batch as we experiment and play with different hop varieties. Find out more. Brown Ale - 4.2% || In 1859, postmaster general Charles Connell, a Carleton County loyalist, ordered new postage for New Brunswick. Uproar ensued in 1860 when the five-cent stamps appeared bearing Charles Connell’s own face, an error that soon resulted in his resignation. Most, though not all, specimens were destroyed and 115 years later, the extremely rare and valuable “Connell Stamp” is prized and sought by collectors around the world. For the rest of the story, visit the Carleton County Historical Society. Brewed in support of the Carleton County Historical Society and Connell House in Woodstock, N.B. Irish Dry Stout - 5% || Timber Hog refers to a fictional New Brunswick forest animal and was even proposed as one of the brewery names in the early days. It was first brewed in 1996. Porter - 5% || In 2006 Picaroons simply needed a porter, so Man's Best Friend was born. RIP Hamish the brewery Scottish Terrier, who’s pictured on the label. Irish Red - 4.8% || First brewed in March 1996 for the Algonquin Resort in St. Andrews. The recipe was developed with the help of the Algonquin’s chef and was originally referred to as “The Algonquin Red,” but we had to change it because some other Algonquin beer existed. We then called it “Finian Irish Red,” but our Irish friends didn’t like it, so it finally became Picaroons Irish Red. Imperial Pale/Pilsner - 7% || First brewed in 2009 for "FEELS GOOD," a local New Brunswick arts community. 5.2% || A dark and chocolatey Valentine’s Day brew made each February with chocolate, ginseng and a dash of cayenne pepper. Giddy-up! Amber Ale - 4.8% || First brewed in 1998, this amber ale was only on tap at the King's Head Inn at King's Landing. This was the first beer to be introduced into Picaroons signature 500ml bottle. English Blonde Ale - 5% || The first Picaroons beer ever brewed! It was originally named “Crooked Log Blonde,” and then bottled as “Whale Ale” for a short while in 1999. Then it was simply renamed as Picaroons Blonde Ale in 2005. India Pale Ale - 6.5% || First brewed in 2006 before the days of this whole IPA cRaZe. The name Yippee IPA actually existed before the beer was ever brewed. We knew we needed a solid IPA to back that solid name and thus Picaroons’ first entry into the IPA world was born. Kölsch - 4.6% || A New Brunswick twist on a German tradition. Using imported German Pilsner malt and a helping of local two-row barley, this beer of golden colour and subtle malt character with slight grassy notes is dry and crisp with a clean finish. Pale Ale - 5% || A pale ale brewed with Amarillo hops and natural apricot extract in support of Fredericton Pride! Amber Ale - 5.5% || A golden amber ale made with New Brunswick malts and featuring lots of hops from various local providers in the Maritimes. The number of batches and hops change from year to year depending on hop harvest. Cream Ale - 5% || First brewed in the spring of 2007. We love maple. We love beer. We needed a spring seasonal in our rotation; we simply did what any proper maple-loving brewer would do. Fruit Beer - 4.5% || A crisp pale ale infused with natural watermelon extract that has a cat on the label. A new cat every year, in fact, as we host our annual Melonhead Cat Contest every spring in which we literally receive thousands of cat pictures from around the country. English Wheat Ale - 4.5% || First brewed in the early days as "Picaroons Canadian Wheat Ale" and was only available on tap. Then it evolved into an all-organic recipe with added coriander and orange peel for this delicious hybrid Canadian-German-Belgian wheat ale. English-Style Barley Wine - 7.5% || First brewed in 1996, Winter Warmer was originally called “Old Red Nosed” and was bottled in 650ml bottles.